- Peterbilt, Kenworth, and Freightliner Dumptrucks are capable of 15-20 MT high dense loads such as mining ore, sand and gravel etc. - Volvo Flatbed Trucks are available to transport crated or loose cargo from Manila or City of San Fernando, La Union. 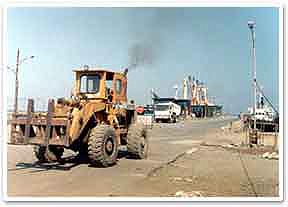 - Cargo handling equipment consisting of Payloader, Forklift, Mobile Crane augment our fleet for loading and discharging of cargo. 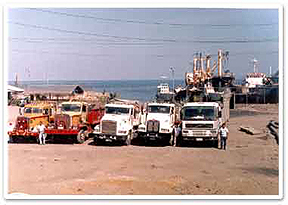 Volvo, Freightliner and Peterbilt flatbed trucks and trailers at the port of Poro Point, City of San Fernando, La Union Philippines. 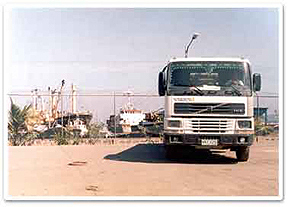 Volvo flatbed truck at pier side, Poro Point, City of San Fernando, La Union, Philippines. Copyright @ 2002 Shipside, Inc. All rights reserved.